More than 1,800 flights were canceled at Chicago airports Wednesday as life-threatening cold descended on the city. At O'Hare Airport, at least 1,479 cancellations and 161 delays were reported as of about 12:30 p.m. CT. The cancellations represented more than half of the day's arrivals and departures, according to Flightaware.com. At Midway Airport, 326 cancellations were reported, about two-thirds of scheduled flights. Delays at both airports were under 15 minutes for flights still operating, according to the Chicago Department of Aviation. 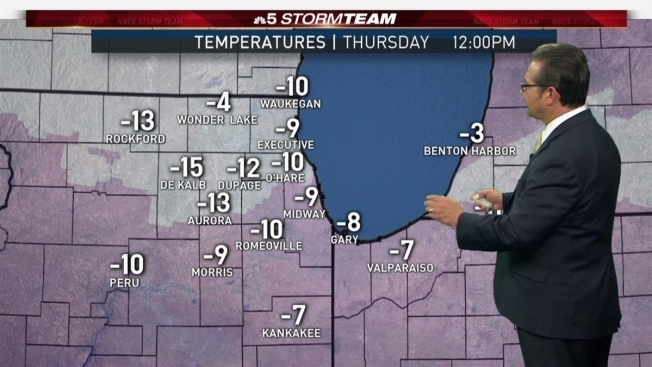 The entire Chicago area was under a Wind Chill Warning beginning Tuesday at 6 p.m. Record-breaking and life-threatening cold hit the area overnight, with morning lows of -15 to -25 degrees with chill values between -45 to -55 with -60 possible. Highs were expected to reach between -10 to -20 with dangerous wind chills through the afternoon between -35 to -50 degrees. There will likely be passing flurries on occasion and the strong wind will create blowing drifting snow with near whiteout conditions, especially in rural locations. There are about 2,400 daily flight operations at O'Hare Airport on average and 500 at Midway, according to the Chicago Department of Aviation.